It’s Christmas Eve. Last year at this time, I was pondering the fact that I enjoyed a very special Thanksgiving with my sister, Susan and her family for the first time in many years and spent my birthday in Indianapolis with my brother, Frank’s family helping with their Nutcracker production. It just felt like maybe I wouldn’t have those opportunities again for a long time and big changes were in the works for us. As a result of my experience doing costumes in the dancers in Indianapolis, I ended up taking a job with NHAPA altering dance costumes starting the beginning of January, fitting and sewing costumes right through May. In the meantime, Kevin had been “laid off” by his major client and our talk of spending more time in Haiti turned into talk of selling the house and moving there full time. We both spent time in Haiti in February. I spent a week and Kev spent two. He returned late Sunday night, February 24th. Then next Friday, March 1st we were meeting with Hannah and her boss from the realty company about listing our house. The next four months were a blur during which we sold, donated and packed “stuff”, and showed our house. Kevin got his 2nd degree black belt in Shaolin Kempo, I finished the hundreds of costumes I had been working on and Hannah earned her Master’s Degree. Kevin made a three week trip to Haiti, returning on July 23 to a not-quite-ready-house and wife. We closed on our house July 26th and left for Gunstock to work at Soulfest for the week. We returned to stay at Kev’s sister, Kristin’s, house and my brother and sister and their families came out for a week of camping/visiting with us and my parents. We had a week of last minute barrel packing, office work, farewell parties accompanied by lots of hugs and tears. August 13th we packed our rented SUV with two suitcases, a dog crate and our dog, Indy, and started driving south to Alabama. We were welcomed at Kev’s brother, Chip’s, house in Athens, AL, our “new” stateside residence, with open arms. Isn’t family awesome? We had a wonderful time getting caught up with Chip and Cindy, though our dogs didn’t really “click”… no surprise there. Indy isn’t known for “playing well with others.” Anyway, we enjoyed meeting new friends at the church there and Kevin was able to get his Alabama license. I didn’t … long story. A week after leaving MA, we left AL and drove to Fort Pierce, FL. We had made arrangements with MFI (Missionary Flights Intl.) to fly us and our dog to Haiti in their little cargo plane with 8 other missionaries and a big load of supplies. We arrived in Grand Goave, Haiti, our “real” new home, on August 22. Since then, we have settled in to our new digs. We have hosted missionary groups, plugged into Mission of Hope Intl. church in Thozin and continue to work in various areas of ministry at the mission. We have begun our pilot ISOM (International School of Ministry) program with the pastoral staff at MOHI. Our dog is happy. We’re learning the language. Adjusting to the culture. Seeing where we fit. For having been here for four months now, I’d say we’re doing just fine. We have wonderful Haitian friends as well as our very loving missionary family, the Edmes, Paraysons and Suttons to name a few, and our new long term missionary nurse and friend, Leah, returns after the New Year :O). It was hard for us to miss out on our annual Chowder Day, our big Groder Family Christmas celebration, although we did Skype with everyone there, including our kids and grandkids. This our first Christmas in a long time without our parents, relatives and special friends but Kev and I are together and surrounded by God’s love and others who share the wonder of Christ’s birth. So, Merry Christmas and God Bless Us Every One! I can’t even imagine where life’s journey will have taken us by this time next year. Tam and I are heading back to Massachusetts for a short trip to visit family, friends and take care for some business. We’ll spend 5 days in MA then off to Alabama, our new residential address in the states, to secure Tammy’s Alabama drivers license. We are so excited to see our kids, grand kids and parents along with as may friends as we can visit in this short time. It’s going to be cold for us! hopefully our blood hasn’t thinned too much. We are planning to ship a barrel to Haiti while we are in the states. Having spent the last 3 months living in Haiti, we have learned the difficulties in securing items there that are otherwise easy to find in the states. If you are interested in adding to this shipment, I’ve built a “Wish List” at Amazon.com. It’s a very easy way to communicate our material needs for those who ask how they can help. You cna see the list, and order from here: Wish List It’s a no pressure request, of course. We’ll ship the barrel in 10 days or so. Thank you to all of our faithful supporters. We hope we can touch base when we are home! Lex and Renee Edmé are the directors of MOHI where Tam and I will live, working hand in hand to fulfill their vision for Haiti as well as ours. Renee is a proficient blog writer and keeps the MOHI supporters well informed with her excellent writing skills. I’m re-posting her recent entries since they reflect the work I’ve been doing for the past month. Once Tammy is here with me and we get settled in, I hope to do more of my own writing. We’re in the midst of the calm after the storm. It’s been so quiet here at MOHI for the past two days. I almost don’t recognize this place. While I’m very grateful for a little break, I’m looking forward to activities starting up again soon. This past week we housed a team of 51 for Mission E4 at our missionary compound. The team seemed to have enjoyed their stay. A. Jay went to work with them for a couple of days and got to enjoy a baptism service where both Haitian and American youth made that all-important decision to follow Jesus. We also worked with a wonderful team from the West Newbury Congregational Church during the week. Long-time MOHI friend, Mindy Rameau, led a tea of twelve to come along side and help with the ministry here. Steve and Wayne built screen doors and shelves for the missionary compound. Doris led a group in children’s ministry. They had their hands full with a bunch of VERY enthusiastic children. Between them and their translators they were able to maintain order, sing, pray, read stories, eat and do lots of hands on projects. Although I’m sure Doris’ team is resting up from the week still, they all had a grand time – almost as much as the children did. Angela was glad to have help again with Mindy’s nurses and physical therapists arriving on the heels of the Bless Back Worldwide medical team’s visit. They were able to follow up on a couple of surgeries from the week before, as well as seeing many new patients. We had an enthusiastic week with the computer club, as Junior put in some extra days with them. We are looking forward to getting some projects going with them soon, as Sora and James (I understand they are INCREDIBLE young volunteers from One Laptop per Child!) will be spending a week working with the club to create projects that can be shared in a blog. I dream of these computer club kids one day developing a school newspaper! We’re having trouble sitting. Our chairs and benches get a LOT of use! We are currently working on reupholstering a few dozen chairs. We’ve put a request before the church, asking each member to donate a bench. We will be repairing/painting our school benches and putting them into the new classrooms, as we prepare for the new school year opening in September. I think Nathan’s trying to tell us something! This week we enjoyed some help from our Sri Lankan friends, serving with MINUSTAH in our area. They brought a back hoe out to our St Etienne campus and excavated some of the mountain to give us more space in front of the school. Their help was greatly appreciated. Pastor Kevin ministered in the Word of God in Thozin this morning and this evening. As you can see in these pictures, if you’re very observant, he was relating the story of David slaying Goliath. We are so grateful for Kevin’s presence here at MOHI for almost a month now. Thank you, Tammy, for your sacrifice!!! Kevin heads back to Massachusetts on Tuesday to be reunited with Tammy, close on their house (Yay!!! ), spend a week working at Soulfest and finishing up preparations for moving to Haiti. 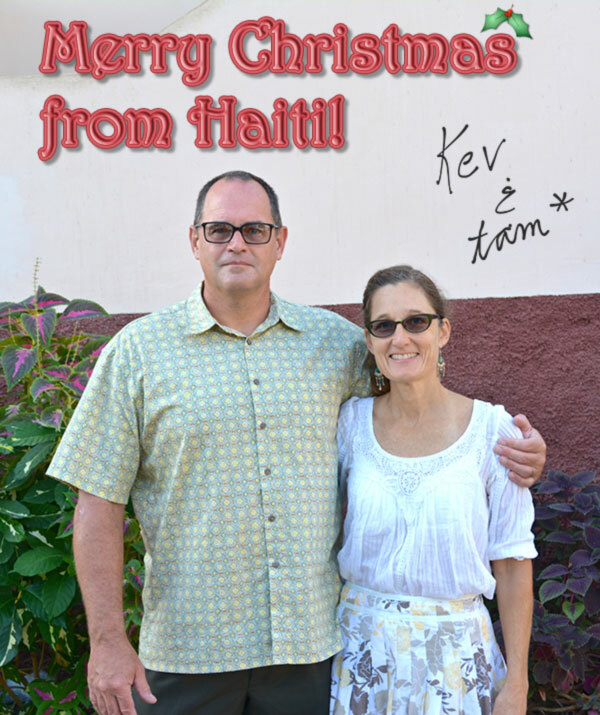 By the middle of next month, we are expecting Kevin and Tammy to be here in Haiti with us full time! Room number 1 is now theirs (Sorry Drex and Jo, but we’ll have another one ready for you in a heartbeat, should you come back for a visit!). The Groders have so much to offer. We’re going to have to make a conscious effort not to over work them upon their arrival! Please remember them in prayer over the next few weeks. There will plenty of opportunity for stress to lay hold, but let’s pray for a smooth and easy transition for them. The first round of “moving” barrels arrived yesterday. I’d say they included the Groder tool shed. Woo Hoo!!! Groups with a Mission… and Hearts to Help. When I was actively looking for an ATV to ship to Haiti, some of my friends said, “You just want a toy to play around with in Haiti!”. Well, I thought I’d use my GoPro to film the “road” I take when traveling from the Mission compound to the Church compound. It includes crossing the river, as you will see. My ATV is sitting in customs in the van that a friend of the ministry, Ted Bronson, donated to MOHI. It’s filled with electrical wiring andsupplies (and my 4-Wheeler) for the school building which is still under construction. We need about $3000 to get it out of customs, which, I know, seems unfair considering it’s donated goods (except my 4-wheeler). Please join us in prayers for funds to come in so we can get the van and goods into service! Now that Tam and I are very close to the point of actually moving to Haiti, we are very excited that we will be able to have “hands on” access to our budding ISOM school. 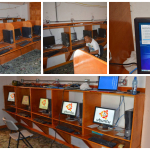 ISOM is one of the many projects we will be implementing here in Haiti. Mission of Hope, where we will live and work, is where our first school has opened. This initial “trail run” is made up of 8 church leaders from the MOHI organization. Pastor Édon is leading the classes which are now moving into the second trimester. We are all very excited to see the vision for ISOM schools begin to take shape here in Haiti. I had opportunity to share the ISOM vision with the attendees of the Annual Conference this past week. There were many leaders present from churches all over Haiti and more than a thousand people in attendance over the 4 day conference. Tam and I hope to make our final move to Haiti this coming August. Once we are firmly planted in Grand Goáve, we will be positioned to take the ISOM program wherever God might lead. Anything we are taking goes into one of these. We should be signing HAVE SIGNED the official Purchase and Sales agreement with the buyer sometime in the next day. This means that we are approaching the final sale of our house very soon! If all goes well with the assessment and documentation, we should close sometime the end of July… yikes! I will be leaving on a previously scheduled trip for Haiti the end of June. This means that we have to get the vast majority of belongings out of the house; sell, donate or trash is the current catch phrase at the Groder household. It is likely we will find ourselves moving to Haiti in mid August. 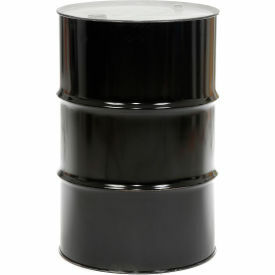 This means I’ll be packing 55 Gallon barrels with the possesions we will bring to Haiti. This will mostly include clothing, computer gear and odds and ends that will be useful to have with us. I looks like we will reduce the contents of our two story house into 4 or more barrels. Talk about simplifying! ON that note, if you know of anyone who can get barrels with locking rings for cheap, I still need some. Upon my return to the states in July, Tam and I will be jumping right into our roles at the Soulfest in Gilford, NH, as we have done for many years. I am the IT coordinator for the event and Tam works in the Box Office and with Hospitality. Please keep us in your prayers as we work through this phase of relocating. Tam especially could use your support as she will be dealing with the brunt of the final preparations while I am in Haiti. As always, thank you for your steadfast support and prayerful encouragement! Our home inspection is this Thursday! So, if your inclined, pray that the home inspector finds our house in good order and ready to pass onto the new buyers! Well, we have a signed purchase and sales agreement! We still must survive the home inspection process, but I don’t for-see any real problems there. If all goes as planned, we will close on the house in late July. <<reality sets in>>. The house is on the market! It’s official, our house is on the market. We’ve had two showings so far and hope to see many more scheduled in the coming weeks. This is the last great hurdle we must traverse before we move. We’ve sorted, trashed, donated and sold so much of our belongings, yet we still have more to go! When we are done, all of our remaining possessions will fit in a few 55 gallon barrels and off to Haiti they go! We covet your prayers as we continue to press toward our call to Haiti. It has not been easy, making the necessary decisions let go off our possessions, friends and family. Sometimes we feel separation anxiety but we know that God is in this, therefore we will go boldly.